The Science in Sport Zinc Chewables deliver 10mg of zinc per serve. Zinc is an essential mineral in enzyme regulation and shows both anti-oxidant and immune boosting properties. 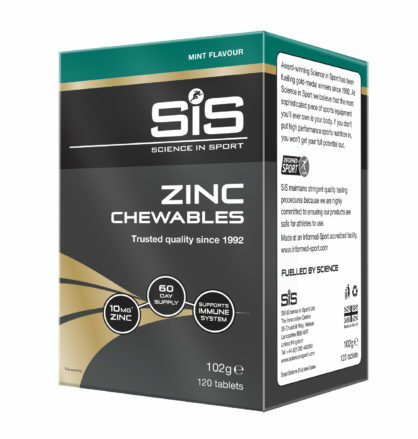 The Science in Sport Zinc Chewables deliver 10mg of zinc per serve, in line with the recommendations for zinc ingestion as a daily preventative measure. Zinc is an essential mineral in enzyme regulation and shows both anti-oxidant and immune boosting properties. Supplementing with zinc has shown reductions in c-reactive protein (a protein found in blood plasma which rises in response to inflammation), IL-6 (a stimulant of the immune response) and other pro-inflammatory cytokines. Zinc deficiency is also known to lead to a reduced T-cell count. T-cells are a kind of white blood cell that support the immune system; therefore, a reduction in T-cell count can have negative outcomes on health. As zinc shows positive effects on immune function support and deficiency can result in supressed immune function, it is recommended to include a daily zinc supplementation to ensure you meet your recommended daily allowance. SiS Zinc Chewables are tested under the Informed Sport Certification program. This approach involves testing every single batch of SIS finished product, which leaves the Company’s factory, screened against the 2018 World Anti-Doping Agency (WADA) list.